Let the fresh scent of cedar wood bring you outside! The Amish Western Red Cedar Royal English Chair Swing is sure to delight. Just right for your porch, patio, or a favorite tree in your garden, this cedar outdoor furniture adds fun with a little frill while you enjoy the fresh air. The elegant top rail of this Royal English Chair Swing is curvy and carved to perfection, adding to the beauty of your outdoor scene. 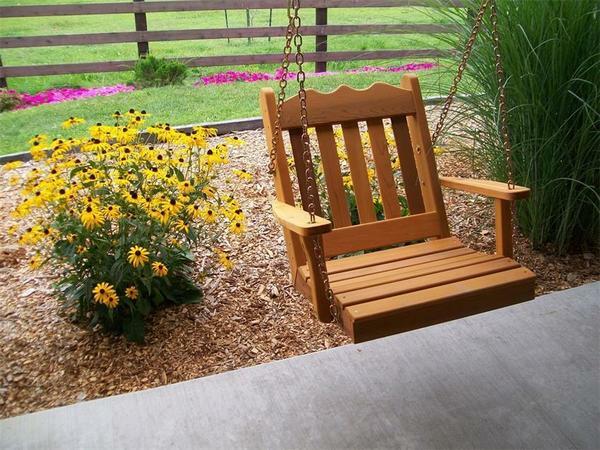 Kids and grandkids alike are sure to seek out this outdoor swing when they come to visit. Made of solid tight knot western red cedar wood this Amish made outdoor swing comes with built in benefits. Cedar is lightweight and resists decay, making it an excellent candidate for outdoor wooden furniture. While we enjoy the scent of cedar, it actually works to repel pesky bugs-keeping them from causing any damage. Cedar is versatile by nature, contributing to your outdoor furniture scene with ease. At DutchCrafters, we love providing our customers with options. Our talented Amish craftsmen create the solid wood furniture you're looking for, your way. Choose from a variety of stains for this cedar outdoor furniture; we are happy to provide samples for you to consider. How about a convenient cup holder for your beverage? We can add that so you can keep your drink with you. Heard of Sundown fabrics? This fabric for outdoor furniture comes in a variety of colors and is covered by a 5 year warranty. Add a throw pillow if you like for a burst of color.